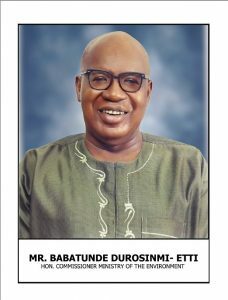 Babatunde Durosinmi–Etti, ex Group Managing Director, Ibile Holdings Limited, former Special Adviser to the Hon. Speaker, Federal House of Representatives and past Senior Special Assistant to the Governor of Lagos State on Revenue and Investment, where he was involved in the implementation of the Revenue Bill that led to the creation of an autonomous Revenue Service for the State, is an astute administrator and a consummate professional. He was educated at the prestigious University of Lagos, where he bagged Bachelors and Master’s degrees in Political Science and Public Administration respectively. He also had a postgraduate degree (MPA) in Public Policy/Personnel Management from the same University and a Johns Hopkins University Master’s Degree in International Public Policy (MIPP) with specialisation in International Development and Political Economy of Sub Saharan Africa. Durosinmi -Etti has vast experience garnered from both private and public sectors. He has worked variously as Accounting Trainee at Arthur Young Oshindero & Co. (Aug. 1979 – June 1980), Administrative Officer at the Nigerian Television Authority (NTA) (1980 – May 1981) and the Nigerian National Petroleum Corporation (NNPC) 1981-1988. His career also traversed the banking sector where he worked at Centre Point Merchant Bank Ltd, Marina, Lagos and Equitorial Trust Bank Ltd. Lagos. As Chief Executive Officer and owner, Support & Management Services Ltd., Babatunde Durosinmi-Etti facilitated the operations of the joint NDI/Carter Centre Election Monitoring exercise for the Nigerian Transition to the Civil Rule Program in 1998/1999 and provided consultancy services for many programmes including the take-off of the NDI Nigeria Field Office, Abuja, NEEDS Assessment and Restructuring of the Lagos State Property Development Corporation (LSDPC) and Restructuring of (SAHCOL) Skypower Aviation Handling & Cargo Company among others. With comprehensive knowledge of State and Local Governments Affairs, he served as government policy consultant to many corporate clients for 28 years and supported various organisations to comply with government regulations. Babatunde Durosinmi-Etti’s dedication and hard work caught the fancy of the Governor of Lagos State, Mr. Akinwunmi Ambode to earn him an appointment in his Administration as the Honourable Commissioner for Wealth Creation and Employment in October 2015, a position in which he served till January 11, 2018 when he was redeployed to the Ministry of the Environment as Honourable Commissioner. He is a member of many professional bodies and associations, including the Association of African Financial Institutions, where he once functioned as Vice Chairman of the Nigerian chapter. He also served on the board of different publicly quoted companiues such as Volkswagen, Nigeria (2008-2012), LASACO Insurance Company (2007-2011) and University Press PLC (2007-2010).